The concept of Eternal life (aside from the usual religious variety, and that of the usual vampire tale) is one fraught with profound implications. In the novel, Steel Beach, by one of my favorite authors, John Varley, these implications are explored in a unique way. After an Earth invasion, and the escape of survivors to the Moon, humankind again thrives, though they are now living on Luna, and their environment is provided inside high tech bubbles that maintain breathable air, and when they venture to the surface outside, they have to wear special space suits. What if modern technology could provide us with instant medical cures and corporeal repairs? What if people could live 200 or 300 years, and almost everything could be fixed? What if you could have your gender changed as easily as you can go get a spa treatment? In Steel Beach, this gender switching, elongated lifespan, an Artificial Intelligence of a “Central Computer” that monitors everything and takes care of it, even on an individual basis, along with a government that provides for the needs of all its citizens, has resulted in a wave of depression and suicidal tendencies. These people find that there is no challenge, no sense of life as something tenuous and precious. The least creative of the bunch seem to suffer most, because they run out of things to be interested in, saddled with such a long lifespan. Still, were those glitches somehow removed, i can say i would love the idea of living, without the aging process, a life of hundreds of years. I’ve always felt there is never enough time to do and be and investigate all that life is. I can always find something to be interested in and am sometimes depressed by the idea that i won’t have enough time in one life to explore it all. It sort of pisses me off. In the real world I live in, people who are okay with their lives, at peace with these things that don’t exist for them except in some future incarnation, also seem to be those who have vivid memories of childhood. It’s as if they are more aware of all the years they’ve lived. But since i can recall only scant snapshots of my younger years, I wonder if there’s some correlation between those who can remember their current past and those who can’t. Those folks can really feel their accomplishments in a visceral way–watching children grow, seeing the results of their parenting, getting the gold watch, seeing their stocks pay off, getting a raise, having the house, the new car, the financial security, the deepening partnership with a mate…my only sense of accomplishment seems to rely on the next book I have in print, the song i write and record, the next picture i paint, sculpture i create…and without those trappings of “success” to go along with them, it’s an exceedingly personal accomplishment, without a great deal of validation given by others–it would take major validation like having a mainstream publisher and contract, or having my art placed in a gallery (I’ve only done that once), or someone famous recording one of my songs, since i am not chasing that musical fame train anymore. Why is validation important? I suspect it is because it helps engender a sense of PURPOSE. Common among the usual variety of people in Varley’s future world, is the statement: “I can’t wait for a day when i can have a vacation, sleep in, stay up late, watch movies, socialize, rest, do what i want.” That’s MY LIFE EVERYDAY. So i am missing that purpose they get in day to day activities… they are missing that free time to do what they want, but i am missing the purpose. The grass is always greener syndrome. Why can’t just doing it for the sake of it be enough for me right now? Is it because life is so limited? Is it because i can’t remember a lot of it? Or because I feel I’ve lost those years and will never have them back, because my body will change, and i will get older and feel the effects of aging, and not enjoy things as i used to? (I’m actually in better shape physically than i have been in the past). Where does this mortality fear come from? Why is it so hard for me to be peaceful in about the limited time I’m given? 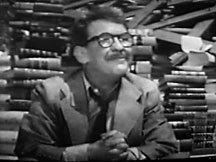 In one of the original Twilight Zone stories, “Time Enough At Last” the author (who is, incidentally one of my relatives) writes about how the world as it was known, has pretty much ended, and there’s one man left on Earth, with nothing to do but read. Finally, he can just camp out at the huge libraries and read all those books he would have never had time to read before…. Then his glasses get broken. He can barely see without them. So, our bodies betray us, and the Universe or God often seems to betray us, when all we want is to do what brings us joy; to just wallow in the Pursuit of Happiness. Is that too much to ask? Why do we have to trade something we don’t want to trade to have it?